Goa, as a destination wedding venue, has soared up the popularity charts in the past few years. The Rome of the East has been a favourite for ages now and turned into a ‘go-to’ wedding destination for many couples. For anyone who’s experienced or witnessed a wedding in this state of western India, they have a bunch of stories to tell you in the form of the sunny beaches, great food and liquor, the stunning wedding venues and a lot of other things. Though this city of all things bright and sunny has a lot to offer, it’ very important to choose the right wedding venue that matches your expectations and doesn’t burn a hole in your pocket. So, if you’ve decided to take the plunge at the exotic locales in Goa and are scouting for some luxurious wedding sites, we present to you a list of the best wedding spots in this city. A well-known name in the hospitality sector, Goa Marriott Resort & Spa is one of the best hotels for weddings in Goa. This gorgeous venue has an event space of 14,000 sq.ft, perfect for hosting elegant wedding functions and ceremonies. The entirely renovated Grand Ballroom party area is best suited to host various pre-wedding and other wedding-related functions. The lawn areas with a stunning waterfront view make it perfect for couples who plan on having an exquisite beachside wedding in Goa. No Indian wedding is complete without a wide range of delicacies, which is why the culinary team at Goa Marriott presents to you some of the best local as well as international delicacies. Grand Mercure Shrem Resort is a fabulous 5-star wedding venue situated in Candolim, just off North Goa’s bustling life. Surrounded by lush greenery, this wedding venue has multiple, swanky hall areas that make it a preferred choice. The resort has stylised rooms spread across 8,000 sq.ft with beautifully designed interiors. The Marque hall is best to host lavish wedding functions and reception parties; whereas, the other banquet halls like Iris, Ivy and Tulip are ideal for hosting pre-wedding ceremonies like sangeet, mehndi, cocktail parties, etc. With their team of culinary experts, they can design a special menu that will be relished by your guests. For couples who wish to have a beachfront wedding, Grand Mercure Shrem Resort, located a few kilometers away from Calangute beach, is the best choice for you! If you want to escape the hustle and bustle of everyday life and plan on having a simple yet elegant wedding ceremony, then Kenilworth Resort & Spa is the best bet. This resort is one of the best wedding venues in Goa that offers 14 acres of land including a hall and two lawn areas. The interiors are reminiscent of the bygone Portuguese era, and the rooms offer a breathtaking view of the Arabian Sea and are decked with all modern amenities. The huge lawn area is picture-perfect for hosting the wedding of your dreams. The other two banquet hall and lawn areas are great for hosting medium-sized pre-wedding functions and other parties. Post all the wedding hullabaloo, if you want to rejuvenate yourself, the venue also offers the best spa facilities. Cidade de Goa is just 10 minutes away from the capital city of Panjim and is considered to be one of the best hotels for weddings in Goa. The hotel tries and celebrates every occasion in true Goan style. The property is located amidst majestic green hills and secluded bay areas that envelope it in complete tranquility, making it one of the sought-after venues when it comes to weddings. The two capacious hall areas and the beautiful vast lawn areas are great to host any wedding function, be it an engagement, mehndi, sangeet function, jaymala, reception or even renewal of vows. With the best accommodation options, state-of-the-art facilities and dining spaces, Cidade de Goa has won numerous awards in a lot of categories, making it the best wedding location in Goa. Holiday Inn is one of the finest 5-star properties in Goa and situated along the shores of the lovely Mobor beach. The most distinctive feature of this venue lies in its beachfront lawns that create a fairytale setting for your wedding with around 600-1000 guests in attendance. Another distinguishing feature of this hotel lies in its ballroom, which is the largest party hall in South Goa with an area measuring 5065 sq.ft. The interiors provide a beautiful blend of Goan and modern architecture and the rooms have private balconies that offer a captivating view of the sea. With a large hall area and multiple voluminous lawn spaces, the venue can easily host a grand Indian wedding! If you’re planning your wedding in Goa, Holiday Inn is the suitable choice for you. Planning to host a beachfront wedding in Goa? Then Park Hyatt definitely cannot skip your mind. This luxurious 5-star wedding destination is by all means a wonderful place to host your wedding. The venue has a hall and two party lawns that are perfect to celebrate your wedding ceremonies in a grand way. With influences from the Portuguese Pousada style, the interiors resonate luxury and style in every way. The venue has been awarded Conde Nast Traveller India Readers Travel Award for 3 consecutive years for the ‘Favourite Leisure Hotel in India’. Apart from having unmatched services and well-equipped rooms and suites, this wedding venue has a team of culinary experts who can design a menu of your choice. Radisson Blu makes a great venue to organise a beachside wedding in Goa and is one of the finest resorts in the city. It offers the choice of selecting a hall or a garden area to organise your wedding but if you’re looking for something more scenic and serene, the beach lawn is stunning enough to have a wedding by the beach. The bright architecture leaves a lasting impression and adds a mesmerising touch to your entire wedding function. Other than the hotel’s various unique features, it also has an elite spa, Jacuzzi and sauna centre that allow you to pamper yourself post wedding. Situated on the white sands of Utorda beach, Planet Hollywood is every film fanatic’s preferred venue to host a destination wedding. The venue is well-known for its architectural marvel that depicts Goan style landscapes and art work. The stand-out feature remains its room that feature a diverse theme of the Hollywood genre through their contemporary art memorabilia. The hall and the two lawn areas have an energetic and cheerful feel to it, making it a choicest wedding venue in South Goa. Apart from offering their signature Pink Room Spa facilities, the hotel also arranges for a customised adventure sports team to pump up your adrenaline. 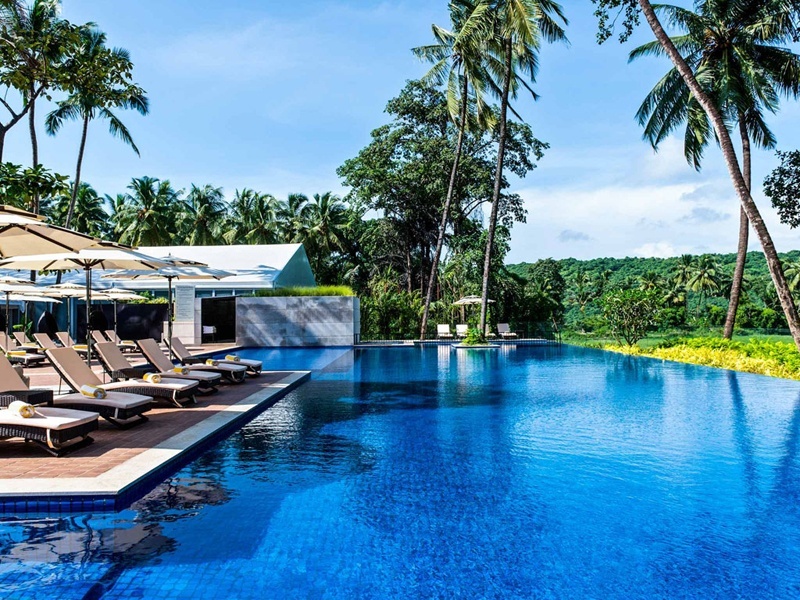 Grand Hyatt is a marvelous 5-star venue in Goa, which overlooks the spectacular waters of Bambolim Bay. The majestic property is spread across 28 acres of two stunning banquet halls and lush green garden areas that allow you to host your wedding with the beach as a backdrop. The interiors speak of the 17th century Indo-Portuguese era and the rooms have a mix of modern and stylish décor. The in-house chefs design a menu that suits your taste buds and let you have a tasting session before the event.